But you know, my point is not, in fact, to sell you on Minneapolis. It’s to point out something that even most people who live hear don’t know. All of those things I mentioned were not gifts. They didn’t fall from the sky, and, no, they were not the result of kind-hearted politicians. In 1934, there was a strike here. 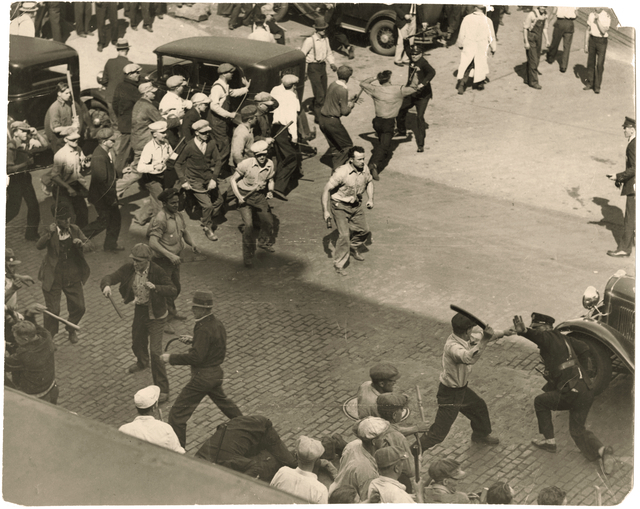 It was one of the formative strikes that built the Teamsters Union (although, ironically, it was opposed at every step by Dan Tobin and the national Teamsters leadership) and the Congress of Industrial Organizations. It was led by Trotskyists, and it broke the Citizens Alliance, an organization of businessmen dedicated to keeping Minneapolis an open shop town. All of the things that make this a good place to live, can be traced, directly or indirectly, to Teamsters Local 574—who incidentally, a bit later, broke up a rally of a Nazi-esque organization called the Silver Shirts so thoroughly they never again amounted to anything. The high point of the strike itself was the Battle of Deputies Run; the name should be sufficient to tell you what happened. Afterwards, for days, the cops didn’t dare show their faces, and the organized workers took over the job of making sure the city kept functioning—and did a damned fine job of it, thank you very much. Shockingly (ahem), the local Democratic Party, as well as the local Republican Party, did all they could to break the strike. The myth here in Minnesota is that Hubert Humphrey emerged fully formed from Minnehaha Falls and bestowed blessings upon the people. Crap. Out of the pugnacious Minneapolis working class grew a Farmer-Labor Party that, in fact, elected a governor–Floyd B. Olson. He, himself, was no hero; but the very fact that the Minnesota labor movement had a political arm, apart from the two capitalist parties—was enough to give us a lot of the things I treasure about this city. It lasted until it was destroyed by a combined effort of the Stalinist Communist Party and—Hubert Humphrey. Humphrey then, as the Trotskyists had warned he would, turned around and smashed the Communist Party. What’s left is that, in Minnesota, the Democratic Party is known as the DFL—Democratic Farmer-Labor, and is the reason the Republicans have never really gotten a foothold here. The other thing that’s left is that, as per protocol, after failing to keep the masses from getting what they wanted, the Democrats claimed credit for them having gotten it. It isn’t that complicated: The more the masses of the working class count only on their own strength, with a solid, determined leadership based on revolutionary socialist principles, the better things are for them—and for all of us. Scan from original on Epson Expression 10000XL. Tom Mackaman has written a historical article, from Farrell Dobbs, one of the SWP leaders of the strike, through James Hoffa, who worked with Tobin to suppress the militant political leadership, through the TDU. It is on the wsws.org, Sept 8, 2018, entitled What is the Teamsters for a Democratic Union? the struggle at UPS. Are you sure about that date? I’m not seeing it.